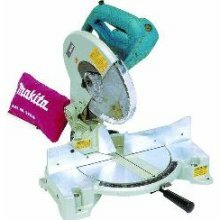 A lot of my crafts require a compound miter saw so I thought it might be a good idea to do a review of the available miter saws for sale. I am focusing on saws with a ten inch blade since this size is sufficient for most projects done by wood crafters. I also am looking at the compound saws versus the regular miter saws because with the compound you have the versatility to cut many different angles, including crosscut and downward. This comes in real handy for doing a birdhouse craft out of a log where the top needs to be cut at angles. Sliding compounds can handle wider wood by turning the blade inward. 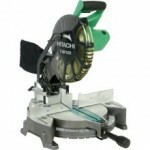 The Hitachi ten inch compound miter saw sells for around $80. It provides smooth and accurate cuts and crosscuts in many different wood products. Of all the product reviews that I had read the only negatives were that one person thought it could use a longer extension and it didn’t include a parts list. All of the reviews said that it cut well and precise. A good saw for the money. 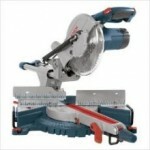 The Craftsman compound miter saw is rated number one by Consumer Search. It is also priced a little higher, at an average around $250. Although, it does come with all of the basic accessories. This saw would be great for anyone needing to cut molding or anything else requiring angle cuts. Reviewers say it is foolproof because it has an automatic angle finder on it that transfers the correct miter settings to the saw automatically by moving the fences instead of the blade. This Makita compound miter saw is a mid price option, at about $160, with a lot of power. It has a 15 amp motor with a dual post compound pivoting arm. It cuts 52 degrees right and 47 degrees left with nine positive stops at 15, 22 1/2, 30 and 45 degrees left or right. This saw has had many positive reviews. The most expensive option is the Bosch sliding compound miter saw. It sells for around $375 but can handle some wider sections of wood than a regular compound miter saw. This particular model puts the controls to the front of the saw which make it fast and easy to make adjustments while working on a project. The single bevel slide mechanism moves the blade easily and fluently through the cut every time. There is never any dangerous binding to worry about. All of these miter saws have had good reviews and would work well for woodworking and wood craft projects. With many craft projects, you could probably get by with a 7 1/2 inch miter saw. But, if you are going to spend the money, the 10 inch is a little more versatile. You can actually buy the Hitachi 10 inch saw for about the same price and some of the 7 1/2 inch saws I’ve seen.